Inbred mice differ widely in their level of resistance to infection with Listeria monocytogenes. This observation was first made by Cheers and MacKenzie (1978) and independently confirmed in our laboratory (Skamene et al. 1979). Pertinent to the topics of this meeting, the strains which were found to be Listeria-susceptible included the BALB/c. The strain survey for resistance and susceptibility to Listeria described in the original paper of Cheers and MacKenzie classifed the following strains as resistant: C57BL/6J, C57BL/10ScSn, B10.D2/Sn, B10.A/SnSg, (B10.A × A) NZB/WEH1, B6C-H-2dBy, SJL/WEH1 and B6.PL (74NS)/Cy. Their susceptible strains (which succumbed to 1/100 equivalent of the lethal dose of resistant strains) were listed as follows: BALB/cJ, CBA/H, DBA/1J, WB/Re and 129/J. 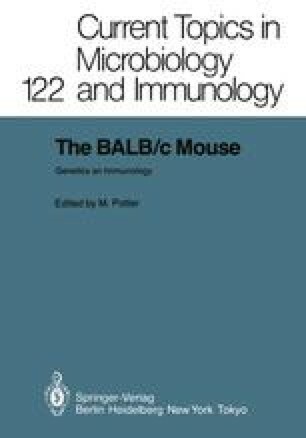 The BALB/cJ mice used in their experiments were derived from the Jackson Laboratory, Bar Harbor, and they were maintained in the laboratories in Melbourne by strict brother-sister mating. Segregation analysis of the trait of Listeria resistance/susceptibility, using the BALB/cJ as a susceptible progenitor and the C57BL/6J as a resistant progenitor led to the conclusion that a single, dominant gene in the C57BL/6J genome regulated the mechanism of resistance, with BALB/cJ carrying the allelic variant of this gene conferring the susceptibility of that strain. This gene, unmapped at that point was named Lr (for Listeria resistance).